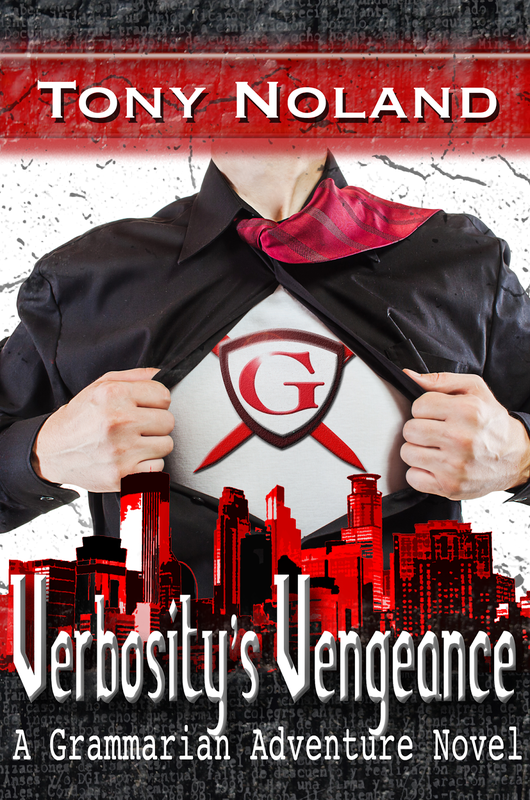 For #AllHallowsRead, enjoy a free copy of "Verbosity's Vengeance", the superhero/sci-fi/lit humor ebook you've been waiting for! Alex Graham’s genius designing video games brought him happiness and made him a fortune, but he never expected to see his work misused by military scientists. The collapse of the mysterious Project Unicorn left Alex with scars, nightmares, and strange powers unlike any other superhero. Years later, as the Grammarian, he uses the strength of supple syntax and the power of perfect punctuation to fight for justice on the mean streets of Lexicon City. When his arch-enemy Professor Verbosity threatens with a mysterious new superweapon, only the Grammarian can stop him… just as soon as he hires a decent sidekick. Mix in the interference of the Avant Guardian (a goofy superhero wanna-be), a vicious stranger who strikes from the shadows, and a beautiful, brainy college professor with an obsession for superhero technology, and the Grammarian has his work cut out for him. A mix of techno-fantasy, superhero science fiction, and humorous wordplay, "Verbosity's Vengeance" will thrill and delight. Available in multiple formats (Kindle, Nook, iBook, PDF, HTML, etc.) from Smashwords, "Verbosity's Vengeance" is free for a limited time. Normally $2.99, this special offer is made to celebrate #AllHallowsRead and to promote literacy all year long. Just use coupon code ER63S when you check out! Click here to order!